The Birtsmorton Court wedding team may have had a few months of beavering away in the office preparing for the year ahead, but work around the grounds certainly hasn’t paused for winter. Our Head Gardener, Mike and his ground maintenance team have been hard at work come rain or shine (as well as wind and snow!) laying the foundations for another year of beautiful blooms ahead. At long last the sun is shining, the birds are singing, the trees are turning green and flowers are popping up all across our vast gardens. Spring is here and we could not be more excited to see Birtsmorton Court back doing what it does best. 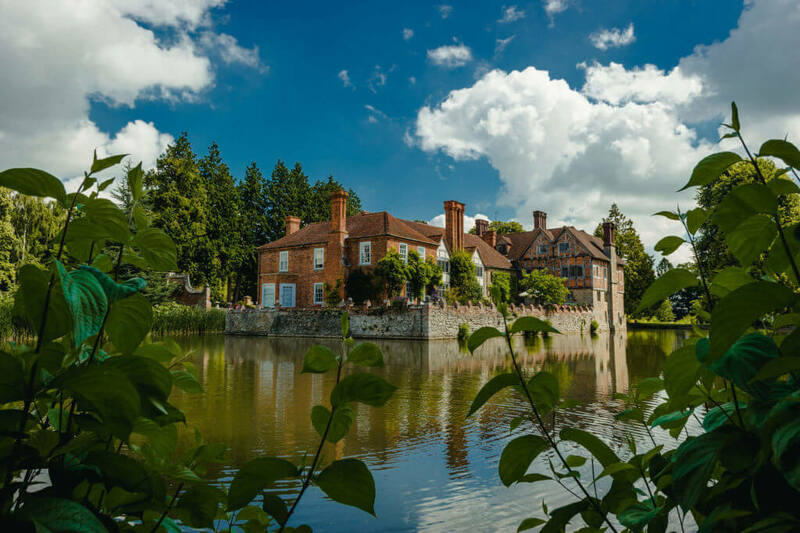 We may be biased, but it’s hard to believe that Birtsmorton Court is not THE most beautiful setting to say ‘I do’ and with a busy year of weddings ahead of us, clearly we’re not alone. We adore showing people around our venue. The reactions as visitors and guests discover the many different areas never gets old! 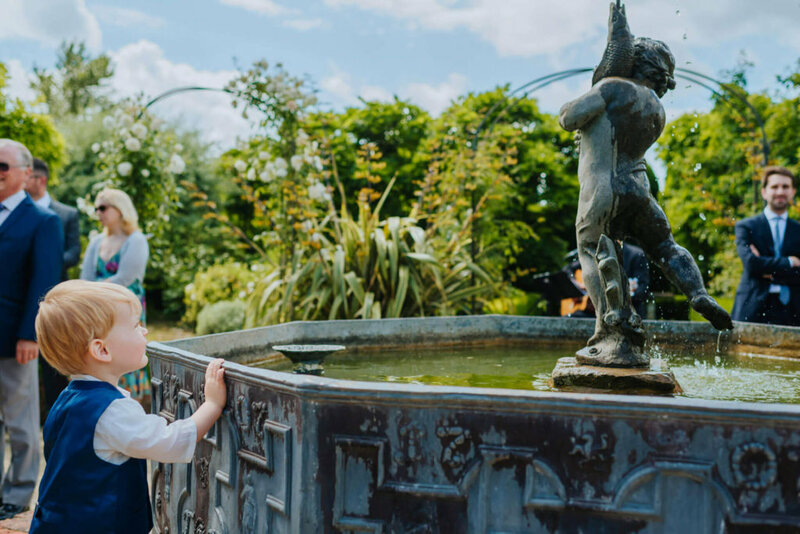 Nothing however makes us happier than seeing your reaction on arrival in to the White Garden, after passing through the avenue of pristine topiary yew trees. No, it’s not a maze, it’s the most picturesque setting for an outside civil ceremony in the West Midlands, transporting you from Worcesterhire to the Italian Riveira. Developed and designed by Mrs Rosalie Dawes, who with her husband Nigel, have owned and occupied Birtsmorton Court since the 1960’s. Rosalie began work on the White Garden in 1997, adding four antique stone statues to what was at the time ‘just a bit of grass’. She then bought the lead tank, which is now a fountain at the heart of the garden, had a local craftsman work on the archways to frame each quadrant and from there, this wonderful garden began to take shape. 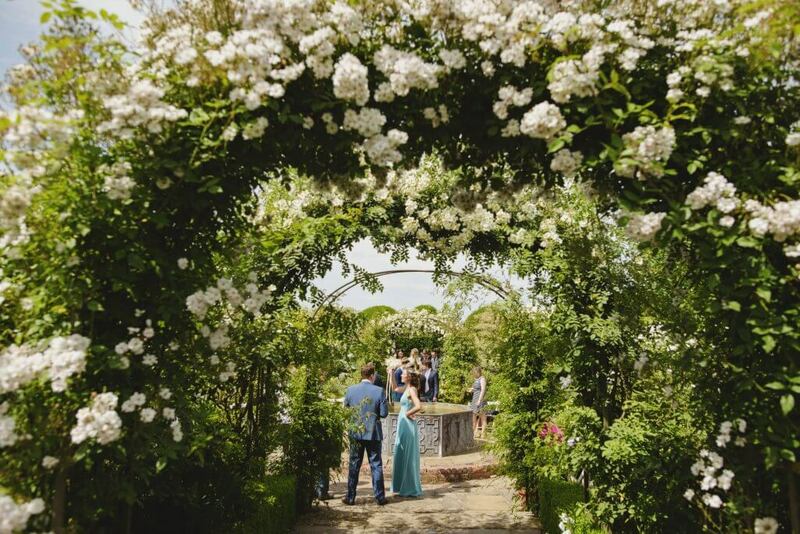 As you enter the White Garden, ‘Wedding Day’ and ‘Iceberg’ roses twine around each arch and behind each of the whimsical statues you will find a backdrop of white Wisteria. There are in fact 20 different varieties of Wisteria planted in the White Garden alone, making for the most magnificent display in May and June. Additional perennial planting is added each year and includes delphiniums, white-edged hostas, cosmos, cleomes and pelargoniums – all in white, of course! With all of this creating the most picturesque backdrop, you can understand why it’s a popular choice for a wedding. 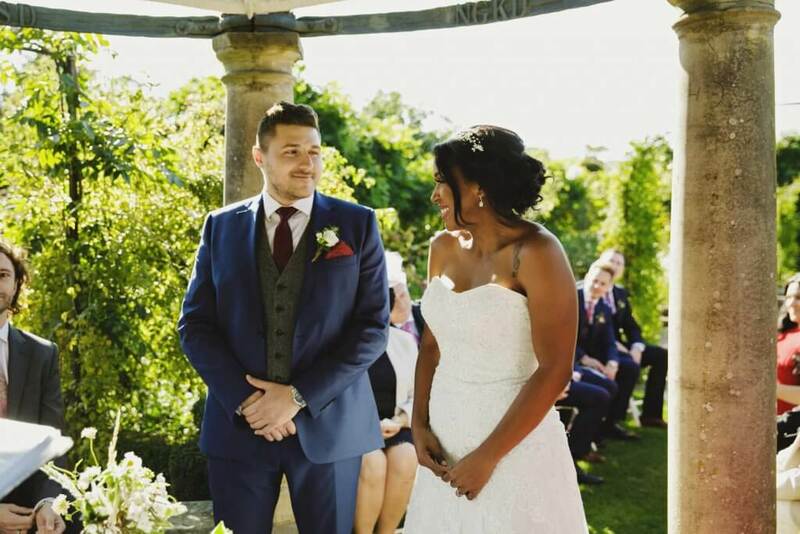 At the heart of the White Garden is our ornate pergola which is licensed for civil ceremonies and has played an integral part in countless wedding days, giving shelter and shade to couples on those hot summer days. The main aisle leading to the pergola has seating for your most important guests, with your remaining friends and family sitting each side. This intriguing layout allows for a 360 degree view and is a fantastic way for your guests to be close to the action and feel included in the most important part of the day. There is plenty of room for musicians, and believe us we’ve seen it all from string quartets to steels drums. You can also opt to put together a few of your favourite songs on a playlist and let our speakers enhance the magic. Your dog is very welcome to join you too! The garden is meticulously cared for throughout the year by our grounds team as well as by Rosalie herself who will often be found in the garden hard at work making sure that every inch looks perfect for your big day. One thing we must talk about (but only briefly) is Plan B. If you elect to have your civil ceremony in the White Garden, a decision is only made with you on the day about what the most practical thing to do is. If the weather isn’t quite on your side, we have two charming indoor alternatives for you to choose from. The Great Hall, situated in the medieval wing of the house and complete with roaring log fire, tapestries and priest holes is the first and The Garden Room, a converted Elizabethan bowling alley filled with fairy lights is the second. There’s so much we could tell you about these spaces, but we’ll save that for a rainy day! 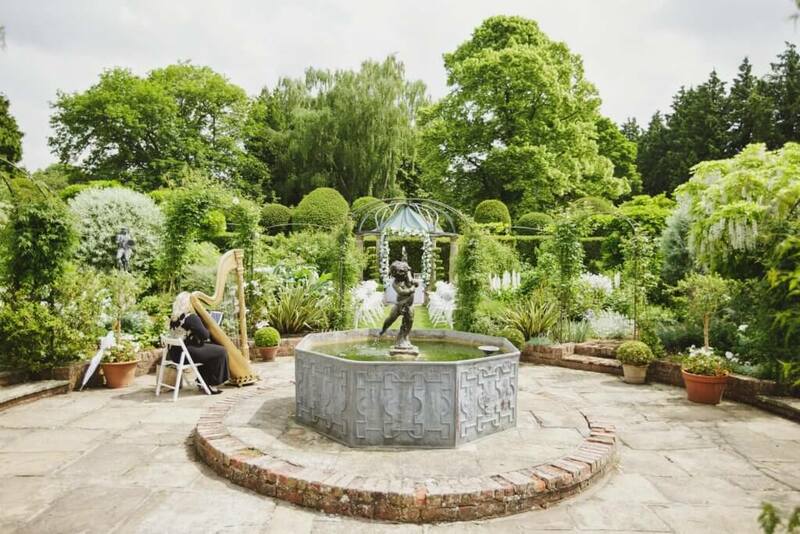 If you have always dreamed of having an outside civil ceremony surrounded by the unimaginable beauty of a perfect English garden then Birtsmorton Court should be at the top of your list. If you haven’t visited us already then why not give our office a call on 01684 833 888 to book a viewing. We can’t wait to see your face as you discover our secret White Garden for yourself.